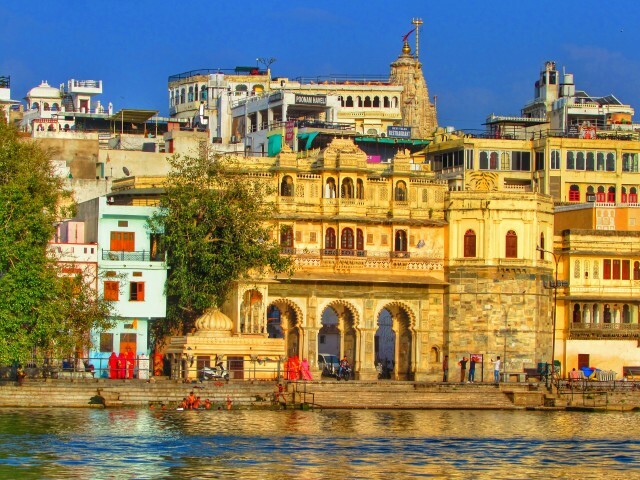 Home Places to Visit Two reflections of Gangaur Ghat : What do YOU think? Two reflections of Gangaur Ghat : What do YOU think? Ghat (noun) a flight of steps leading down to a river or a lake. A ghat is a place at the banks of a lake or a river which is generally used by the locals to bathe and wash their clothes. Ghats are also used by the locals for the celebration of the Hindu Festivals in India. 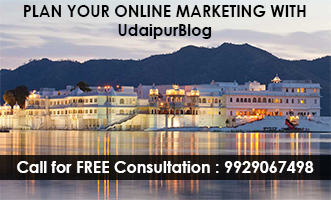 Gangaur Ghat is definitely one of the most scenic and beautiful destinations in Udaipur. Its name was originally taken after the most popular local festival of Udaipur called ‘Gangaur’. Located in the heart of the city by the side of the Lake Pichola, it is just a few minutes drive from any part of the city. Although reaching the ghat can be difficult at times when you are in a four wheeler, the roads leading to the ghat are narrow and busy – try not to get stuck! 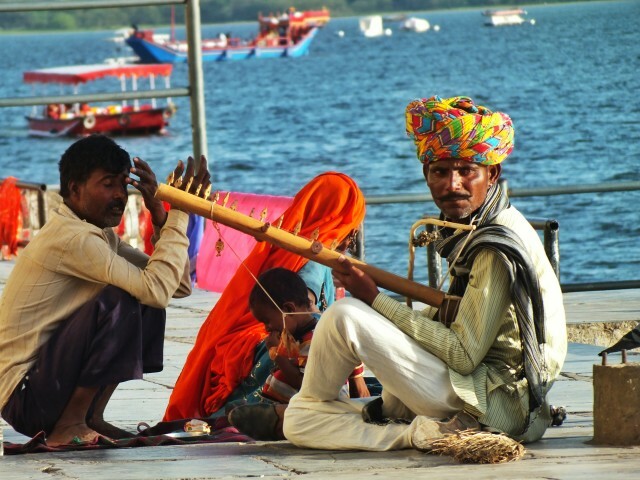 Sitting by the lake on the Gangaur Ghat, Udaipur is beautiful. And once it becomes evening and the lights begin to shine, it’s the cherry on the cake. Spending a busy day in Udaipur working or learning or whatever you do, an evening at the Gangaur Ghat is something for which my words will always be short. Sitting and enjoying the calm breeze and listening to both upcoming musicians and traditional musicians playing folk music is the best way to relax. And if not, simply plug in your earphones and click some of the coolest pictures of Udaipur, because that’s what I do every day! But we all know that every coin has two faces and that’s exactly the same case with the ghat too. There are aspects which need serious improvement; it is filled with stray animals, be it dogs, cows and even bulls. Having no other shelter these animals have made ghat their home. Additionally, the pollution which comes from locals bathing and washing is contaminating the water and leaving a nasty residue. On a more positive note once again, discovering the inner you at the ghat is one of the nicest ways to enjoy it. Just being you, one can create some of the best stories for their life, which can be as old as the ghat is. And if someday you are not in the mood to create your own story you can be a part of someone else’s story. As a friend of mine told me, she loved becoming part of a Spanish couple’s story. Being at the ghat allows you to open your mind to your thoughts and concerns that day, I know this through personal experience – you can spend hours sitting at the ghat and you don’t want to get up and go home. It has given me some amazing experiences; I would just like to say I Love You #GangaurGhat. That’s not to say I don’t adore it – I do, I love the energy, the diversity, the absurd scenes that only India can pull off. I love watching the way the colours change throughout the day; I love the beautiful buildings and their shadows. I love watching the kids playing games, swimming in the water and stuffing bottles down their shorts to help them float. 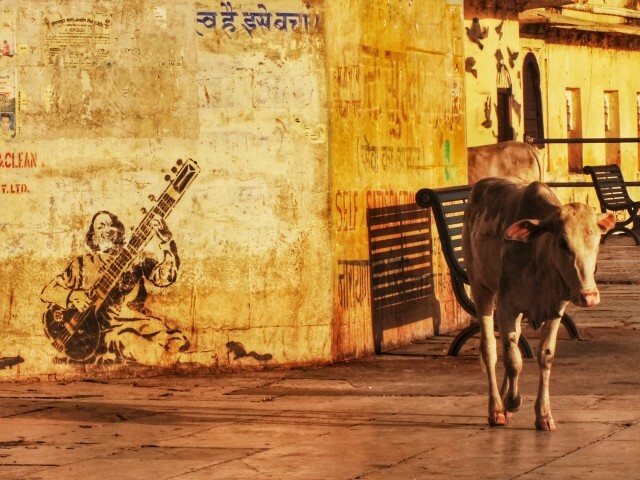 Despite the litter and pollution, as a foreigner, the cows and skinny dogs munching on plastic add a charm that few countries could get away with. The positives and negatives of the ghat come together in a strange sort of harmony for me. In a totally different way, I too, love you! #GangaurGhat. However you feel, the one aspect we think everyone can agree on is the unbelievable creative platform that it provides. It’s hard not to feel inspired by the medley of music, artists and musicians; groups of youths clustered around guitars, melodic poojas, the nostalgic sounds of a sitar blending with bicycle bells and chattering voices making an incredibly unique soundtrack. Not to mention the perfect combination of the water’s reflection, captivating activity, beautiful buildings to motivate and channel anyone’s inner photographer. It’s a space to tell stories, be alone or come together, make friends and connect with others. As we sit writing this, we are inspired by the scene around us – perhaps our next collaboration project is here, hiding behind a lens or harmonica? Half English, Half American, Lucy is the author of www.lucysmilesaway.com. She has spent the last six years travelling. She has spent a lot of time travelling in Asia (specifically India) and Europe, interspersed with trips back to the United States. You can catch her on: Facebook, Instagram and Twitter. Next articleArt of Bicycle Udaipur: The True Art of Exploring Lies Here!